Mayorca, Modern pick your finishes! Bathrooms: 3 "and 1 half"
Lot Size: 1905 sq. ft.
*DISCLAIMER: The pictures included in this listing are for informational purposes only, the listing is meant to depict the style of construction that can be provided by the developer for future construction within the development, henceforth the home illustrated in this post cannot be shown. This two-story oceanfront home features 3 bedrooms with walk-in closets, 3 and a half bathrooms, 2 car attached garage and approximately 2,800 square feet of living area. The home is finished with all luxury materials, from either granite or marble in the kitchen and bathrooms to gorgeous ceilings with recessed lighting throughout with a unique design exclusive to Real Mediterraneo. This specific model features all modern finishes and stainless steel appliances, however, there are other styles that you can choose from. The design of the home was created to take advantage of the wide ocean views from anywhere inside the property. The patio is on the ocean side of the house and is large enough for dining, having a bar, an outdoor grill, and more. Real Mediterráneo offers spectacular contemporary and modern beach homes located in an exclusive area on the coast of the Pacific Ocean, where you will able to live in total harmony, comfort, and privacy. For over a decade It has provided luxurious properties that live up to the highest standards of excellence. This high-end community boasts some of Baja’s best Real Estate all within an earshot of the sounds of the Pacific Ocean. Real Mediterráneo provides you a unique and secluded private beach experience with a large sandy beach enclosed by cliffs to the north and south, and vehicle access so you can launch jet skis, kayaks, small boats, or other watercraft. Enjoy gorgeous sunsets on one of the most beautiful private beaches on the Baja California coast with views of the Coronado Island directly in front of the community. It also features a 24 hour guarded gate and security. Real Mediterráneo provides exclusive access to their residents of a custom built Clubhouse that they have with the ability to reserve for private events. The spacious upstairs patio area and downstairs grass area can seat up to 150 guests. Real Mediterráneo is located just 20 minutes from the San Ysidro Border, 15 minutes from Downtown Rosarito, and only 1 hour from Ensenada; it is perfectly located to take advantage of all that Baja California has to offer. Explore the energetic city of Tijuana, the beautiful beach community of Rosarito and eat a delicious lobster dinner in Puerto Nuevo. Or take a memorable wine tasting trip to Ensenada. 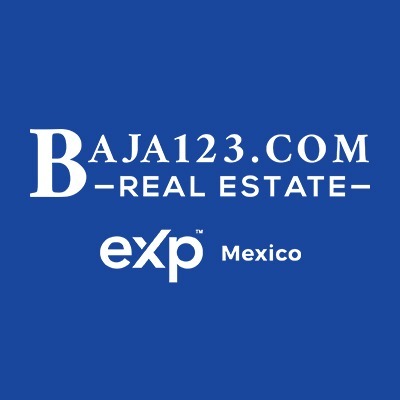 Come and experience the beauty and tranquility of this exceptional high-end community and discover the finest qualities a Baja Real estate property can offer.